Accessories: Accompanied by Patek Philippe Certificate of Origin dated November 24, 2015, product literature, leather wallet, fitted presentation box and outer packaging. Launched in 2010, reference 5170 has undergone a number of transformations, with the very first model cased in yellow gold. In 2013 a white gold version was launched, featuring white pulsometer scale. 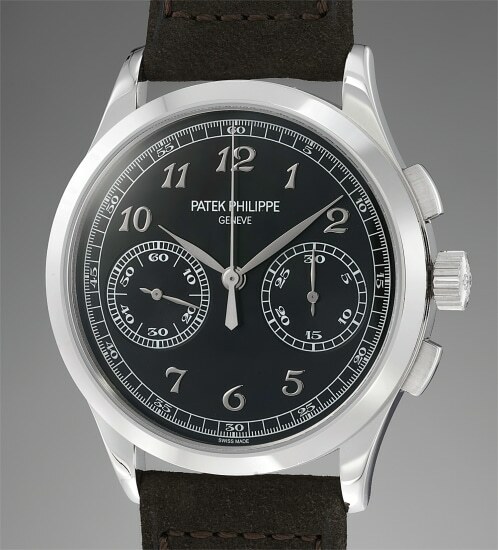 The model most notably features the caliber 29-535 PS with the Patek Philippe Seal. Introduced at Basel in 2015, this iteration of reference 5170 displays an attractive black dial with Breguet numerals and feuille hands. The launch of this model provided a novel aesthetic for the beloved model. Offered in excellent condition, this timepiece must have been worn a few times only. It is furthermore accompanied by all its original accessories such as the Certificate of Origin, product literature, wallet, fitted presentation box and outer packaging.